Rhythm for artists, is the ordering and arrangement of lines, tones and colors to affect the viewer. It is your form of artistic expression. Science show us that sound, heat and light are rhythmic forms of energy. You want to give your figures energy and a sense of life. Figures are composed of contours and masses. 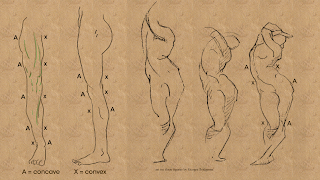 The power of your drawn figures are due to the arrangement of your lines, tones and colors and affect the viewer on an emotional, visceral level. Don’t search for perfection in your art, search for the individual, search for the life. The subtle variety in your drawing is what creates vitality, not perfection. Unity and variety will always walk together and unity leads that walk or variety will run buck wild, like a child throwing a tantrum. Too much variety becomes ugly. The right balance of unity and variety creates beauty. We have art software applications that allow you to draw the face in prefect symmetry. Yet the result is not very appealing, because real faces are not symmetrical. Real faces have variety because of subtle variations. Your drawing style derives from the “mistakes” you make consistently. Variety in unity. At a casual glance, our limbs may seem symmetrical. Let us look at the leg as an example. each side seems symmetrical, yet has it’s share of variety. A variety of symmetry used by a variety of opposition. When there is a concave curve on one side, there is a convex curve on the opposite side. 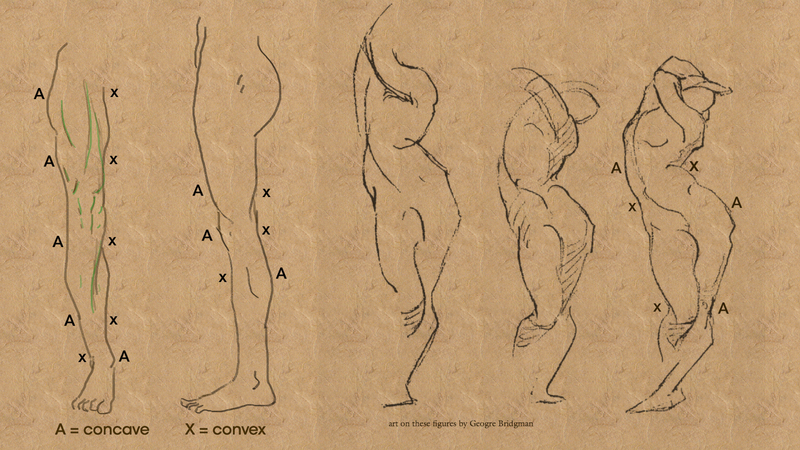 You will find this rhythm throughout the figure. My diagram on the left. Bridgman figures on right. read next - What Are The Ideal Body Measurements? previous - How Do I Keep From Looking Goofy?